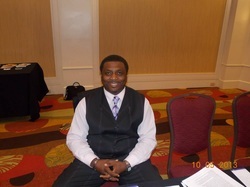 Kevin A Rasberry is a native of Orangeburg SC. He is a graduate of Orangeburg Wilkinson High School, Alumnus of Claflin and Limestone Universities respectively. He currently holds a Bachelor’s degree in Business Administration, a Bachelor’s degree in Psychology, a associates degree in Human Resources and currently he is enrolled in the MBA program at the University of Phoenix. He is a Army veteran, mentor of 20+ years, husband to Germaine Middleton-Rasberry and father of four Terrence, Ulanda, Tyler and Donovan. Kevin is also a best-selling author of the self-help book Decisions and Consequences-The Realities of Being a Man. He has recently released his second book, Evolution of The Good Man, which was adapted into the stage play Confessions of a Good Man and opened to four consecutive sold out shows in July 2013. The play is currently on tour throughout the United States and slated to entertain the troops in Germany in 2015. However, Kevin’s passion is being the catalyst of the historic new charter school Garden City Preparatory Academy for Boys. It is the first single gender public school in the history of South Carolina. The school is slated to open in August of 2014. How is Your Work Changing The Narrative? Our work is being effective agents for change within our community. We are passionate about saving the boys of South Carolina and the United States through mentorship and a unique model to provide them with the best education. Young boys become men regardless of if they are taught what kind of man to be. Our work is to teach them how to be productive, trusted and respected leaders. Our work is to make them good men.